Hackney has been branded as Britain's 'worst place to live'. We can see why those for whom statistics are sacred might make that judgement. Hackney bumps along the bottom of any table of social well-being you care to consult. Hackney also has a reputation ­ - alas a deserved reputation ­- for violence. There have been numerous 'gangland executions', mostly to do with drugs. I had two churches to look after in my time in Hackney. They are a mile apart, at opposite ends of a road now known locally as 'murder mile'. Hackney FreeSchool, like the borough beyond its school gates, is a vibrant community. It is also a multi-cultural community. The school welcomes children of many different religious affiliations. It is staffed by believers, half-believers and non-believers. Such a school must affirm its Christian tradition, but it must not pretend to be a confessional community. Its common ground must be its shared spirituality, not a shared Christian commitment. The nurture of the spirit is the most important thing a school can do. That's why Mark Cazalet and I were looking for a space somewhere in the school which could become the 'still centre' of its turning world. We believed that this space should be designed in such a way as to be true to the school's Christian story, but that equally it should affirm and encourage the spiritual quest of those with other stories to tell. Eventually we found our space ­ in a disused boys' privy off the backstairs. This little room­ has now been set apart as a place of quiet. It was blessed and dedicated by the Bishop of London on 17 April 2007. The Jerusalem Space serves as a room for reflection and prayer, as a tiny chapel where bread is broken and which at all times is 'a place for being in'. Its name speaks of the earthly Jerusalem, a city sacred to Jew, Christian, and Moslem alike, yet a city riven by fear and hatred. So we bring to this room both our shared hope for a humanity transformed by love and our despair for our brokenness. Its name speaks too of 'the New Jerusalem', the city we must all seek if our lives are to be more than a futile sequence of wasted days. From the outset we were committed to making this space beautiful. Inner-city children are starved of beauty. Where all around is brutal and ugly, the spirit withers. By contrast, as Mark Brokenshire has written, 'It is impossible to be exposed to something wonderful and not to be changed by it'. So we set out to transform this room. We wanted our children to feel that, when they stepped into this room, tiny as it is, they were entering a larger and lovelier world. 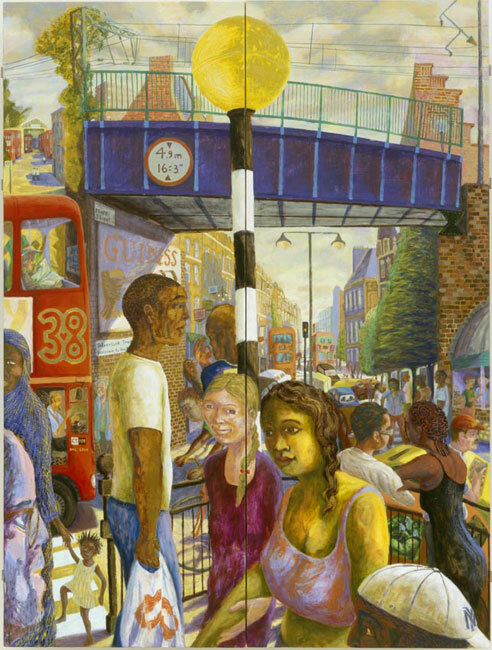 In a glowing triptych, Mark Cazalet has depicted 'Christ the Light of Hackney'. When the triptych is closed, we see Hackney in all its polychrome splendour. There is the no 38 bus. There is the bridge carrying the North London Line, with its night-time traffic of nuclear waste for Sellafield and its daytime travellers between Frognal and North Woolwich. There too are all Hackney's rainbow people, bathed in a celestial light. When the triptych is opened we see three events from John's gospel ­all taking place in Hackney. There in the shallow end of the recently re-opened Hackney Lido is the Samaritan woman, to whom Christ offers living water. The man born blind is fishing from the Regent's Canal. Through the skeletal framework of the gasholders beyond the canal, we glimpse 'the gherkin' and other towers of the distant City. Finally, Lazarus in his string-vest is seen rising from one of the tombs in St John-at-Hackney churchyard. But ­hold on,­ is it Lazarus? Is it perhaps Christ himself? Or is it one of Hackney's homeless, one of the many who from time to time bed down for the night in one of the churchyard's once handsome 'table tombs'? You wonder. Which, of course, is what you are supposed to do. Charles Gurrey has carved a Tree of Life. The simple wooden furnishings of the room,­ the plain bench beneath the window and the Holy Table­ are lovingly made. This room teaches us to be still. No lesson is more important, none more rarely taught. 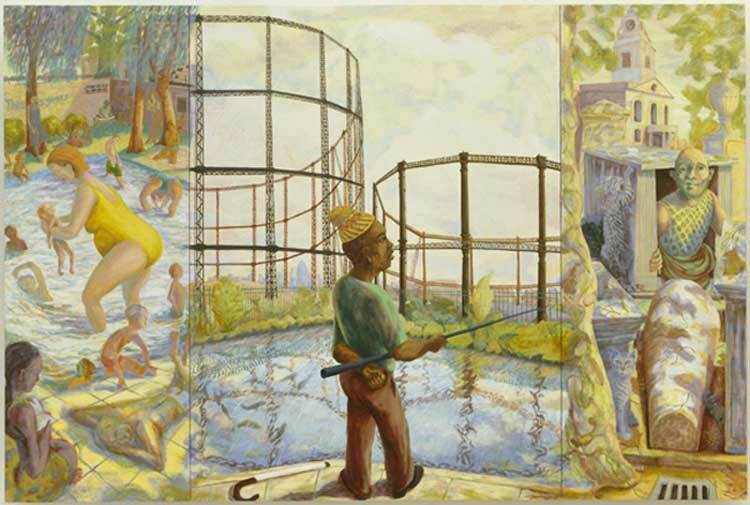 Marc Cazalet: Christ the Light of Hackney and Three Johanine Healings, Jerusalem Room Triptych, HackneyFreeSchool, 2006, oil on wood, 122 x 184cm (open), 122 x 92 cm (closed), HackneyFreeSchool, London, England. Mark Cazalet (b. 1964) is a British artist who was trained at Chelsea and then Falmouth College of Art before being awarded two post graduate scholarships at L’Ecole des-beaux-Arts in Paris and MS University Baroda in India. The experience of working abroad expanded his references, materials and working processes, providing a richly diverse cultural context for his practice. On returning to the UK Cazalet began a pattern of alternating commissioned projects with his own themes. He has completed large-scale glass and painted works for many ecclesiastical settings including Worcester, Manchester and Chelmsford Cathedrals. He works with fabricators in materials as varied as mosaic, mural, stained glass, etched/engraved glass and textiles. Cazalet’s parallel studio practice is based around drawing, painting and printmaking. His studio-based work is usually concerned with landscape themes, particularly informed by particular qualities of light, colour and presence. In 2012 and 2013 he spent several months as an artist in residence at The Josef and Anni Albers Foundation in Connecticut,USA. Some of his recent works are an engraved glass design of St Cedd for Chelmsford Cathedral and an abstract reredos screen for the Church of the Epiphany Doha, Qatar. Mark Cazalet was born and continues to live and work in London. See www.markcazalet.co.uk. This article was first published on the website of Hackney Free School.